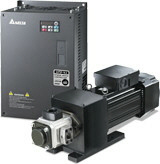 40% less energy consumption compared to a variable pump hydraulic systems. 60% less energy consumption compared to a traditional quantitative pump hydraulic system. Purchase your Delta HES Series – Hybrid Energy System today!